Snoots help control light spill like barndoors, but are not adjustable. 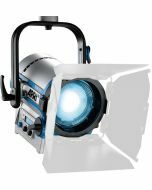 Designed specifically for the Arri L5 LED Fresnel. Works with Color, Tungsten Tuneable, and Daylight Tuneable versions.